1. Bioassessment: Using aquatic insects as indicators of water quality, volunteers learn more about the health of their neighborhood creeks and identify potential problem areas. Community members, local college students, and volunteer groups can help collect specimens for identification. 2. GPS Creek Surveys: Using Global Positioning System (GPS) technology, volunteers monitor the current conditions of their neighborhood creeks. In the summer and fall adventurous volunteers wade into local creeks, mapping the physical attributes of the stream channel (substrate, canopy cover, bank characteristics, etc. ), extent and type of native and invasive vegetation, and human influences (outfalls, dams, etc.). 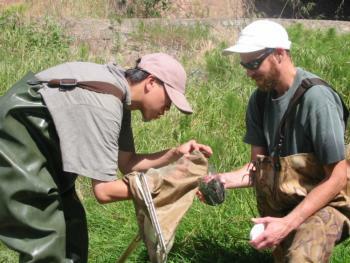 A third component of the CCFF program is the Assistance and Resource Center: The Watershed Monitoring Coordinator can provide assistance to groups in Contra Costa County who are involved in creek monitoring activities. Equipment can be borrowed from the program (when it isn't being used by the program) and technical assistance is availiable to provide help with data collection activities.